Yay. Congratulations. Send me your snail mail address through email at maxthequiltcat@gmail.com and I'll send it to the Pawmetto people. They will make sure you receive your prize of treats. Hope you enjoy them as much as we have. Flat Max is all tuckered out today. It was a busy weekend and he met many wonderful people at the Book Fair. HH had a great time talking to everyone and she sold some books and the greeting cards were a hit. So, all-in-all. It was a great weekend. 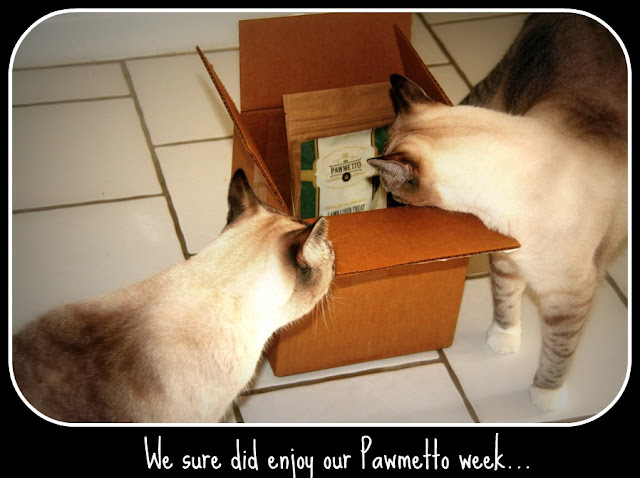 Thanks to the Pawmetto people for the super giveaway week. We enjoyed it. That's for sure. what fun that they won! Mom and I just love them and all they do. Concats to the Moewmeowman on winning your comment draw - we're sure they'll be delighted. Hooray for the winner and I am gla to hear that the book fair was fun and successful! Concats to Meowmoewmans for winning--and on a successful book fair! Oh, and thank you SO much for having such a tasty giveaway. We are excited to have been selected as the winner, and have emailed you our snail mail address. and Yay for your book fair !!!! That do be a lot of commenties! Concatulations to the winner! Concatulations to the winner! And I'm glad your human had a good weekend at the book fair - mine is selling my books and calendars at a couple of local cat shows for the holidays! Concatulations to the winners and to HH for the book and card sales! Congrats to Meowmeowmans! We wonder if he will share the treats with the shelter kitties?? Glad things are getting back to normal. We've been at the CWA Cat Writer Association conference (where we won an award for best color photography) and now playing blog catchup.